What lessons should be learned from ‘colour’ revolutions? 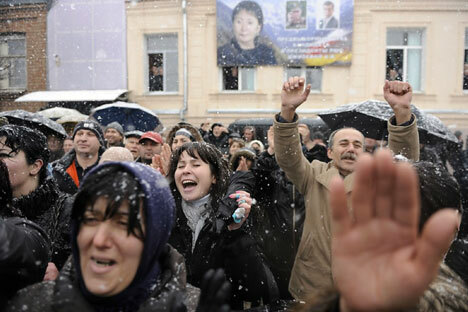 This month marks nine years since Georgia’s Rose Revolution and eight years since Ukraine’s Orange Revolution. Both events were widely discussed in the international media and are now viewed as model ‘colour’ revolutions. The more time passes since those events, the less successful the consequences appear. Speaking about ‘colour’ revolutions can often be rather confusing with people not having a clear understanding of what these revolutions were all about. What makes them different from traditional revolutions? The answer is clear: a traditional revolution is about radical changes, while ‘colour’ revolutions simply result in minor changes of what is on the surface. The best thing a government can do to prevent public uprising is to carry out a moderate and balanced social policy. Any revolution is definitely caused by some domestic difficulties. Foreign support is another reason behind a ‘colour’ revolution. The U.S. is a major source of money for those who stage ‘colour’ revolution. The former American leader George W. Bush, whose administration witnessed almost all the ‘colour’ revolutions, never denied his approval of ‘new democracies’ emerging in the world. It is remarkable that ‘colour’ revolutions mainly take place in the countries where democratic processes have already begun. Authoritarian regimes cannot be toppled this way. And what is even more important here is that the success of a colour revolution does not necessarily mean that a country will become truly democratic. The level of its democratisation can remain the same (as in Ukraine) or even diminish (Georgia). Russian historian and politician Natalia Narochnitskaya believes that the success of ‘coloyr revolutions’ shows a deep crisis of democracy as a concept. If a group of people who control practically all financial flows in the country can protest against the official results of elections and attract several thousands of supporters, the elections can hardly be viewed as expression of will by the nation. An attempt by the U.S. (or any other country) to impose its will (even if their intentions are peaceful and sincere, which is a matter of debate) cannot result in anything but a tragedy for both the ‘pupils’ and the ‘teachers’. This is a lesson which should be learned from ‘colour’ revolutions taking place in the post-Soviet territory.